If you found yourself enchanted by the springtime installations dotting the Coachella Valley, be glad: More art is to come. IF IT IS HUMAN... to seek shared experiences that make us think, that move us, and that stick with us in a lasting way, then the installations seen around the Coachella Valley over some of the late winter and early spring of 2017 easily drew out our common human-share-ability. For Desert X, the spread-wide art exhibition, gave both locals and visitors to the area a chance to view often sizable and starkly displayed works for free. 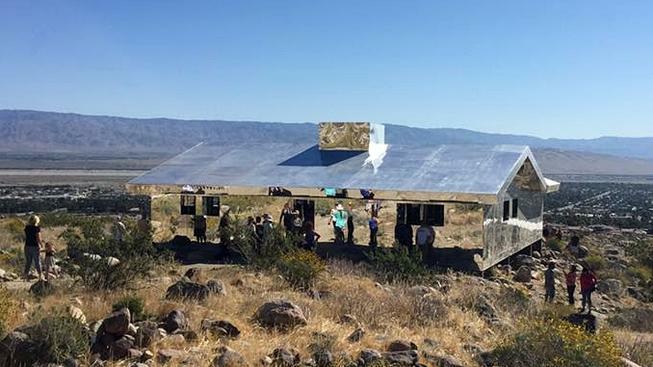 Those works included "The Circle of Land and Sky" from artist Phillip K. Smith, a circular and sandy outdoor space hemmed by a row of tall, thin mirrors, and "Mirage" by Doug Aitken. DESERT X 2019: An opening date for the exhibition, which will again include an array of site-specific installations, was revealed on Monday, Oct. 9. So mark Feb. 9, 2019 on your calendar, with the knowledge that Desert X 2019 will shutter at the close of April that year, much like it did in 2017. Neville Wakefield will again serve as Artistic Director, with Amanda Hunt, Director of Education & Public Programs at the Museum of Contemporary Art, Los Angeles, and curator Matthew Schum serving as co-curators on the large-scale, large-of-vision project. And, yes: The exhibition will likely coincide with the Coachella Music and Arts Festival, like it did in 2017.